Some of us spend hours in the office environment and at our desk. We could actually call this our second home. A clean and organised office workspace, means you can work efficiently without all the clutter and dusty surfaces, this clears the mind and has health benefits too! So if you’re interested in keeping your office neat, clean and organised, we have listed a guide to general office cleaning. Have a look at your desk right now. Piles of papers, books and stationery? 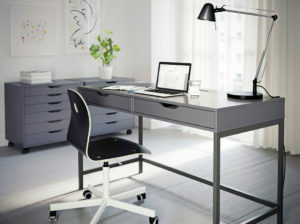 Not only does this look unorganised, there’s probably lots of dust accumulating in and around those area on your desk. A nightmare for some who suffer from allergies. Weekly, go through all your paperwork, shred those documents that are no longer needed. Where possible, arrange with a recycling company to collect your paper and other recyclable items. Keep important documents at an arm’s length and for less important documents make use of a filing cabinet or lever arch files. This will clear up lots of clutter on your desk. Dust the desk surfaces at minimum every second day. Use a coaster for your coffee cup, this eliminates and coffee cup stains on your desk. Get all your stationery organised, stationery stores a have a large selection of holders, desk organisers and refuse bins. Computer, mouse, printers and any other office electronics and equipment attract and harbour germs and bacteria because of how frequently people use these items. The surfaces of some of these items can often be dirtier than a toilet seat. Here are some tips to keep these clean. Always first check manufacturer’s instructions when cleaning any electronic equipment. Microfibre cloths are best for cleaning computer screens and any other surfaces as they do not scratch the surfaces. Using a suitable cleaning chemical and a microfiber cloth, wipe down all the tops off electronic equipment to get rid of dust and any germs that may be lurking on these surfaces. These tasks need to be carried out daily. Either by yourself if you have a small office, or if you employ an office cleaning company then these tasks can be carried out by their employee. Waiting rooms and reception areas, this is the first contact for your clients, make sure these areas are dust free and clean. Wipe all surfaces including blinds or chandeliers. If this area is carpeted, vacuum regularly too. We often find that office waiting room chairs need a deep cleaning now and then, for this you can contact weClean for a quote on deep cleaning of office chairs. Regularly check for marks on walls. Sanitise and wipe light switches too. Empty refuse bins daily as they get full. Refuse bins are a breeding ground for bacteria and also attract flies. Vacuum office carpets regularly and for those that do not have carpets these floors need to be mopped daily – always remember to use a wet floor warning sign whilst mopping floors. Clean up any spills as they happen, this will reduce the need for stain removal later on. Glass tables and glass surfaces need to be polished daily. Throughout the day people are touching these surfaces which leave fingerprints and oily smudges. Although there are so many more tips we can share, these items listed above should help with general office cleaning chores. We realise that cleaning the office can be a daunting task and can take up lots of your valuable time. With that said, a clean office is of utmost importance, your clients and employees appreciate a clean office environment. A clean office portrays a professional image for your business. For all your office and commercial cleaning requirements, speak to us for an obligation free quotation. Thank you for taking the time to read our guide to general office cleaning.